Need some help to build your healthy eating habits? Learn how to build healthy eating habits that will last a lifetime, step by step, day by day. Stop struggling with diets you hate and guilt you don't need. Learn how to steadily build your healthy eating habits until you enjoy eating healthy food. Imagine no longer beating yourself up about the healthy food choices you feel you should be making...because you actually WILL be making them. Every day. Are you confused about what foods you should be eating to achieve your health goals? Are you busy and need to learn easy and efficient ways to make healthy eating an automatic part of your lifestyle? Do you know how to eat healthy, but haven’t built the self-discipline to stick to a healthy diet? Do you have trouble staying motivated and resisting temptation? Do you have trouble planning healthy meals and finding healthy recipes? Are you finding it difficult to make healthy eating an everyday habit? You’re not alone. That’s why I created Veg Up. Statistically, most people attempting to make significant dietary changes last less than a week. That’s not long enough to form a permanent habit. Veg Up holds your hand through a full 30 days until your healthy eating habits are like cement. Build healthy eating habits into your daily routine, step by step. Learn how to really make sure you eat 5 vegetables a day. Check off daily tasks and recipes so you can clearly see your progress. Stay motivated and stick to your healthy eating goals. The Veg Up workbook makes you conscious of your vegetable intake and guides you in identifying correct serving sizes. Veg Up also provides you with a daily healthy eating plan that ensures you eat a rainbow of vegetables. With varied recipes for green smoothies, vegetable salads, side dishes and mains, Veg Up gives you a variety of delicious vegetable dishes you can include in your diet. To increase consumption, Veg Up guides you through buying more fresh produce, adding more serves to each meal, using new recipes and increasing the variety of vegetables you eat. Veg Up is a day by day e-workbook that can help you solve all these problems and more. 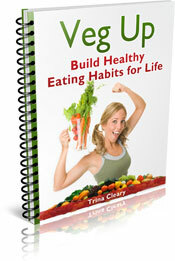 Veg Up gives you a daily healthy eating plan in an easy to use workbook format. Are you prepared to look and feel great? You can give your body the help it needs to maintain top levels of vitality and health. All this and more can be achieved through healthy eating. Food is one of the best and easiest ways to positively influence your health. Veg Up teaches you what you need to know to practice healthy eating for a lifetime. Working through Veg Up made me feel stronger and younger. I don't feel my age any more and I feel like when I eat well I'm preventing disease and fighting things off. Whether you are trying to kick your fast food habits, switch to healthy eating routines to help you lose weight, or simply get more vegetables into your diet, Veg Up! is the last workbook you’ll ever have to try. Keep it simple AND make it work! Learn how to replace your fast food cravings for an urge for vegetable salad! You can get your body so used to eating healthy food that you won’t want anything else! No more dieting or worrying about food. You’ll simply be in the habit of eating healthy all the time. How much is it worth to you to finally reach your health goals? Veg Up talks about more than what to eat when and why. It’s a workbook that keeps you motivated and on track. Daily tasks and recipes are set out clearly and simply. Yes, you will also have to work at it, but this is not a quick fix that won’t stick. Your ultimate goal is a health transformation that will last. The Veg Up process involves thorough goal-setting, ongoing self-assessments, daily affirmations and progress checklists. You’ll be frequently reminded about why you wanted to get so healthy in the first place and then given the tools to stay on track. The problem with most “diets” is that they’re only about food. Diet books just tell you to record your weight. I liked how Veg Up asked me to record how I was feeling. It was like a feedback loop that kept reinforcing me to just keep doing it. Veg Up gets you mentally prepared, motivated and equipped to build healthy eating habits long term. You can learn to do more than count calories. We need to eat healthy food for so many reasons. Veg Up rounds out your knowledge so that you fully appreciate healthy food. Learn how to give your body the best fuel and the best foods for your purposes. With balanced knowledge about healthy eating, you can make informed choices in the most positive way. By the end of your Veg Up journey you’ll have the skills and knowledge you need to make your own healthy food choices. You’ll also have learnt some handy tricks for avoiding temptation and keeping yourself motivated. Veg Up! sets all the steps out for you in an easy to use day by day format. As well as the 30 day workbook, you also get 3 bonus preparation days to get yourself equipped mentally and physically. You’ll have the satisfaction of ticking off your achievements at the end of each day. Being able to see your progress so clearly is such a strong motivating force. What a great product! I’m going to recommend it to my life coaching clients when they have nutrition issues (and I’m going to use it myself). What I personally love about it is that it helps clear the confusion about what to eat. And it makes it simple. Then you go on to help the reader get more confidence and knowledge so she/he can go on without the e-book. It’s like you’re starting the reader off with training wheels. Veg Up breaks it down manageable chunks so that you can make progress every day. Gradually build your healthy eating habits with Veg Up and you’ll be grateful for a lifetime. Change your life now. Do you really get your 2 and 5? Think about today. 5 serves of vegetables and 2 serves of fruit? What about yesterday? How about I show you the tips and motivate you through the steps to establishing a regular habit of 2 and 5? This is not the health version of a get-rich-quick scheme, there aren’t any shortcuts.... well, ok, there are a few, but these habits are so healthy and tasty that they’re not really cheating. Veg Up gives you the map that gets you on the right road, heading in the right direction. This isn’t your regular kind of e-book. For a start, it’s no GTQ (get thin quick) scheme. It’s more like a workbook, and you also need to make an effort for the habit to successfully form. With affirmations and exercises to keep you focused and motivated, healthy tips and recipes that you can act on immediately and reflection strategies that will keep up headed in the right direction, this healthy habits workbook will hold your hand as you strive towards healthier eating habits that will set you on track for life. While it takes 30 days to set up a habit, you'll enjoy the benefits for the rest of your life. Veg Up is more than just a workbook, it’s a community. You’ll receive ongoing support from me whenever you have questions – that’s the beauty of purchasing from a person, not a publishing company. There are also online Veg Up forums at each stage of your journey. You’ll be able to share with others who are on the same trip. In the months and years ahead, learn and contribute more on Growing Raw with your fellow Veg Up travellers. Ready to make your healthy eating goals reality? You can do this! If you have the desire and are willing to make a huge positive change to your life, then you can start your journey in less than 5 minutes. I am here to help. Get the book. Download it in less than 5 minutes and get off the junk food treadmill now. The biggest advantage of an e-workbook is that you will receive it instantly. You don’t have to wait for delivery, and you don’t have to pay for shipping either. You can download your e-workbook and start changing your life right away. You also have all the direct links you need to access resources, forums and references. If you are still unsure whether this is for you or not, then have a look at what other Veg Up readers have said. Their feedback best explains how well this e-workbook really works. The most significant thing Veg Up did for me was give me structure. Instead of having to guess what I should be doing and making it up as I went along all I had to do was follow instructions. It was far more achievable for me to change my eating habits than doing it all myself. I didn't know how easy it was going to be to include vegetables in my diet. I don't like recipes where I have to prepare a lot of stuff because I'm lazy, so I liked how easy the Veg Up recipes were. The information about portions was really useful for me, I didn't know that before. People think it takes ages to cook healthy food so they just buy prepackaged stuff, but then they don't even know what they're eating. I didn't have a such a healthy lifestyle and I thought 30 days would be too long for me so I decided to give Veg Up a try and see if I could last a week. My family all laughed at me and made bets that I wouldn't last. It wasn't as hard as I thought and I actually enjoyed the food even though I thought I wouldn't so I just kept going. I didn't have to buy much extra food which I was worried about too. Now I can't believe I really did it! Miracles do happen. My family was stunned because before I was so unhealthy before. Veg Up costs only $17 US. That's less than what a jar of vitamins cost you. It’s roughly equivalent to the cost of a takeaway pizza, but Veg Up! sends your health forwards, not backwards. It's a tiny fraction of what you will have to pay for medical expenses associated with the illnesses that result from an unhealthy diet. Being able to successfully create permanent healthy eating habits is priceless. 30 days worth of daily goal and task checklists. Dozens of healthy recipes that are simple to prepare. 3 preparation days to prep your body and mind for the task. Key insights into why most people fail to change their eating habits, and how to make sure you really succeed. Motivational resources including goal-setting, self-assessments, affirmations and reflections. Comprehensive nutritional information with handy weblinks. Tips for adding vegetables to every meal of the day. A 100% unconditional 3-month money-back guarantee! If the Veg Up e-workbook is not for you just say so within three months of purchasing it and you'll receive a quick and courteous refund. 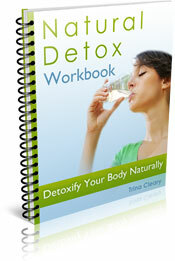 Order today to receive a bonus copy of the Natural Detox Workbook and learn how to detoxify your body naturally. A great prep for the Veg Up Workbook that shows you how to use the best detoxification product available - your body!